Plenty has been said about a man whose most lauded deed (in mankind's collective memory) was done nine and a half years before I was born. I don't really know very much about Neil Armstrong. He was, for me, as a child, more of a symbol than a person. I fantasized about the idea of being a Neil Armstrong more than I ever worked towards becoming one. I understand now, better than I did as a child, how unlikely it is that I will ever follow in his "small step." Even so, it was dreams of that step, dreamt as a small child, and expression of those dreams, that prompted parents and aunts and uncles to tell me, if you want to be an astronaut, you have to be good at math and science. I don't know... maybe I would have pursued an education in science even if I hadn't spent my early years in the afterglow of the Apollo program. I don't think so. I think that all of the buzz about moon landings and the new Space Shuttle program that followed had a huge influence on my thinking. I believe that I am who I am today, in part, because of Neil Armstrong and the dreams that he and his colleagues inspired. There are many photographs of the moon available online. Some amazing ones. Enjoy them. 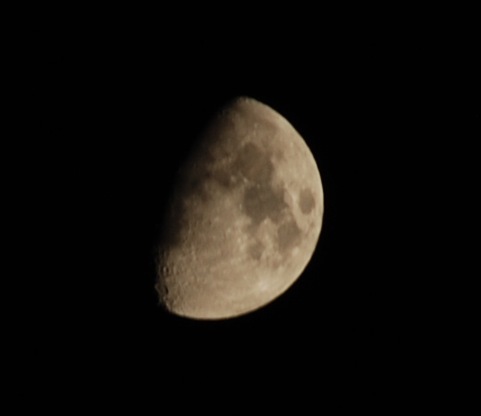 Here is one that I took tonight, minutes after learning of Neil Armstrong's death. Thank you, Mr. Armstrong. Rest in peace. An absence. Also, an opportunity.